The Triple Cheese - up amongst the best sellers and certainly well-loved by its many fans. It is packed with real cheese - not some kind of nasty tasting 'cheese' concoction found in the standard cheese pie. We use a generous mix of feta, mozzarella and strong cheddar. The customers particularly enjoy the discovery that the cheese is both on the inside and the outside. This piroshki of mine is based on Khachapuri. 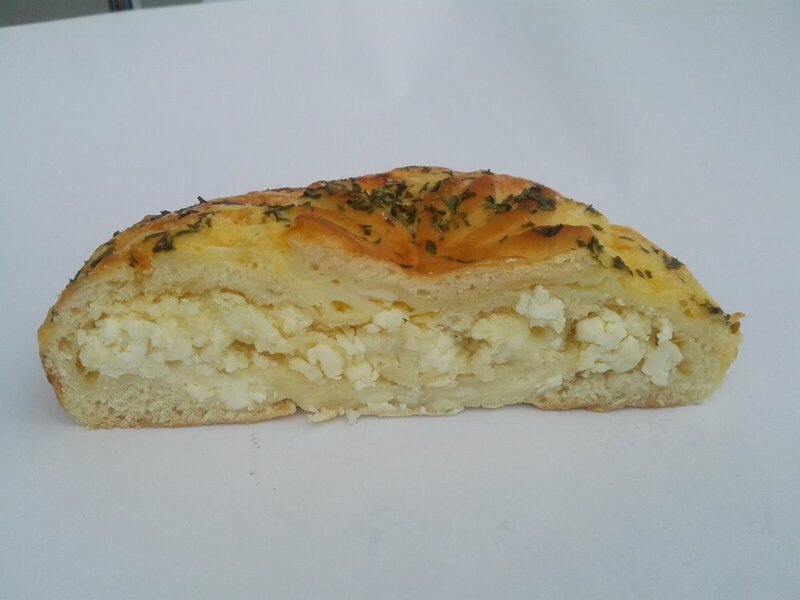 This is a traditional Georgian dish of cheese-filled bread. The Khachapuri dough is leavened and allowed to rise, and is shaped in various ways, usually with cheese in the middle and a crust which is ripped off and used to dip in the cheese. If you should have a slice left over from the night before then you will find it after warming it up again in the oven for breakfast, it comes out like a freshly made cheese toasty !